Summary: Caldecott Honor book for beautiful illustrations. A day in the life of a brother and sister and family spent exploring their world and making connections to the entire world around them. Genre: Picture book depicting a fictional day in the life of a family. Setting: A spring or summer day in the life of two young children beginning in the morning and moving through to the evening. Characterization: Main characters are two young children a boy and a girl and their family. The book is their perception of the world around them on one day. Theme: The World is full of wonderful and marvelous things to see, hear, touch and know. And we experience all these things together with one another. Point of View: The world’s point of view from someone who lives in a coastal area mostly likely in North America. Gender: Good for both boys and girls who are represented equally. Race: This book illustrates a multi-racial family and extended family and community. Culture: This book seems to show a small community which works and plays together. It could be any community with people from all different backgrounds represented. Ability: The book represents multi-generations that value both young and old. Theology: God created all the Earth with meaning and purpose all around us to be shared with one another. The Earth has a cycle and so do we. If the plants and flowers rely on the bees, who do we rely on? When do you think the people in the story take time to pray to God? Can you remember a time in the church where we all come together and sing and listen? What do you think God’s plan for the world looks like? 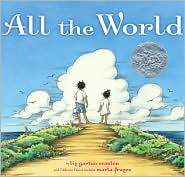 All the World by Storypath is licensed under a Creative Commons Attribution-NonCommercial 4.0 International License.